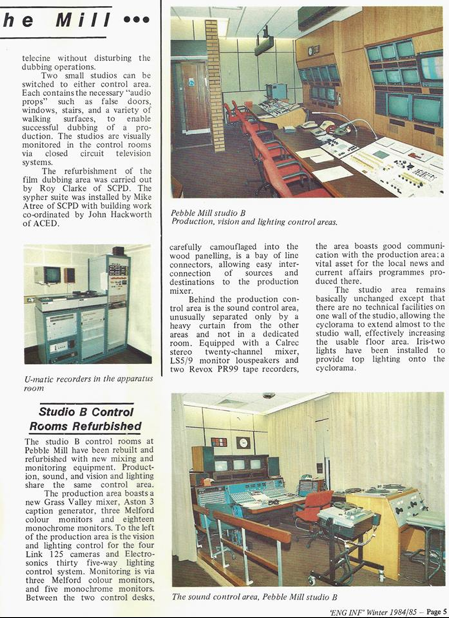 Thanks to Peter Poole for sharing these pages about technical developments, including a new dubbing and sypher suite, and Studio B control room refurbishment, at Pebble Mill in the internal BBC Engineering Newsletter from 1984/5. Keith Brook: ‘The original 1/4″ location sound was transferred onto special 16mm separate magnetic, sep-mag, film. Now, the film and the sound were the same ‘size’ and could be edited together by the film editor. If it was drama, for example, you’d end up with a complete film and dialogue track but minus the music, sound effects, wild-track and so on. You would them make a second, or third, sep-mag track that had the music, effects and so on, all in the right places but with extra lead-in and lead-out. 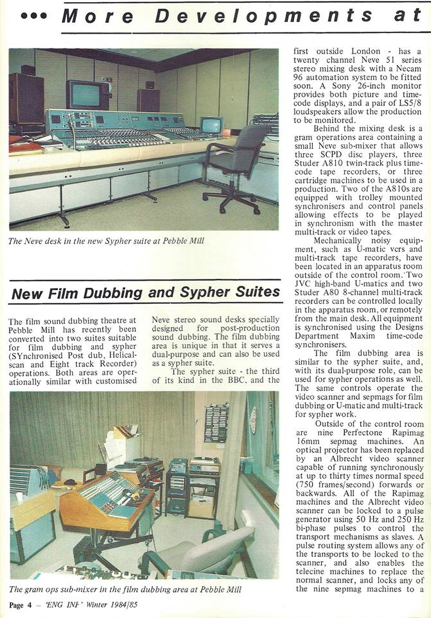 Dubbing was where you took that 16mm film, its matching 16mm dialogue track, the other tracks and put them on a huge machine that kept everything in sync. You would then run the whole lot through a sound mixer onto a final track, fading the effects in and out according to a dubbing script that matched the frame counter.